A swan suffers a mysterious death, its neck wrung by apparent supernatural forces. A young woman dies alone in a hospital room, apparently strangled by mysterious means. Sir Michael Ferrara is found strangled in his bedroom with no one else there. Dr. Bruce Cairn and his son Robert are faced with a mystery that involves deeper, darker, more ancient forces than they could have imagined. Who is Sir Michael's adopted son Antony really? And who is the brood of the Witch Queen? . . .The clocks had chimed eleven when I gave up, and I felt physically sick. The air by this time was poisonous, literally poisonous. I dropped into the easy-chair and began to wonder what the end of it would be. Then, in the shadowy parts of the room, outside the circle of light cast by the lamp, I detected—darker patches. For awhile I tried to believe that they were imaginary, but when I saw one move along the bookcase, glide down its side, and come across the carpet, towards me, I knew that they were not. Before heaven, sir"—his voice shook—"either I am mad, or to-night my room was filled with things that crawled! They were everywhere; on the floor, on the walls, even on the ceiling above me! Where the light was I couldn't detect them, but the shadows were alive, alive with things—the size of my two hands; and in the growing stillness—"
His voice had become husky. Dr. Cairn stood still, as a man of stone, watching him. Sax Rohmer is most famous for creating the diabolical Fu Manchu, but he was also a writer of weird and asupernatural tales. 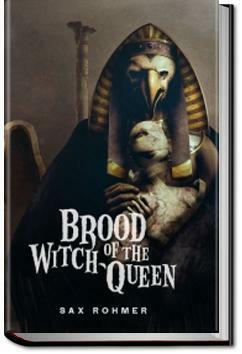 This book presents 12 of his wierd fictions and the full-length novel of Egyptian horror, Brood of the Witch-Queen. This book was written nearly a century ago, so maybe that accounts for my negative feelings about it. I guess he was using cheesy phrases and syntax before it was cheesy. Fairly interesting story. Not nearly up to horror standards of today, but it had its moments. Due to this being written in London in the early 1900s, the language can be difficult to follow at times.